The Connection Between Gluten Intolerance And Autism, Depression, Brain Fog, Migraines And More. Dr. Ritamarie Loscalzo's Inspiring Lecture At Raw Health Expo In Sebastopol! Dr. Ritamarie Loscalzo (left) inspired me to learn more about gluten and health. Stay tuned for more gluten free recipes! I initially wasn't even going to go to the Raw Health Expo last weekend. I'd been to several in the past and didn't know how much more I was going to get out of it. Boy, was I wrong! I have never really focused that much on gluten intolerance other than to make as many of my recipes gluten free as possible. My husband and I eat a lot of wheat products so I probably didn't want to learn something that would make me have to avoid one of my favorite foods. But this year I learned that my beautiful grand niece was diagnosed with autism and I had recently read several short articles about the possible connection between autism and gluten intolerance. So when I saw Dr. Ritamarie Loscalzo on the agenda discussing "The Magic of Gluten Free", I was excited about going and getting the latest information! It's Not Just About Celiac! She feels that it's possible that 30% to 60% of the population may have a problem with gluten! One of the reasons people lose weight when on a raw food diet is that they eat until they are full. Then they stop! Those of us who occasionally enjoy pasta and baked goods are familiar with the feeling that you can eat these foods until you are way passed being full. Personally, I can eat my weight in pasta. My husband's addiction is freshly baked bread. Why does this happen? According to Dr. Loscalzo, when the body breaks down gluten, 20 endorphin like, opiate peptides are produced which are similar to cocaine and opium. Normally these peptides get split into amino acids to be used by the body. But for many people who's digestion has been impaired, for whatever reason, these gluten peptides cannot break down and bind to the opioid receptors in the brain. This causes "addiction" and craving for gluten foods like pasta and bread. Some autistic kids will demonstrate self abusive behavior like hitting their heads into a wall. This behavior has been linked to the opioid peptides from gluten and from milk protein. Because their opioid receptors in their brain is activated, they don't feel pain. Studies have shown a decrease in this activity when gluten and dairy was removed from the diet. Dr. Loscalzo has seen people with brain fog get clarity almost immediately after eliminating gluten from their diets. One of her clients was able to significantly decrease her antidepressant medication after going gluten free. After 6 months, a client with Hashimodo demonstrated the disappearance of thyroid antibodies. (Ironically, the thyroid medication Synthroid, contains gluten!) Gluten free clients with severe sensitivities would revert back to their issues with the ingestion of a single crouton! Dr. Loscalzo herself conquered migraines with a mostly raw food, gluten free diet. But many other things also contain gluten. I had a friend whose wife had celiac disease and was extremely ill. Despite her strict gluten free diet, she continued to have serious problems only to fine out that her lip gloss contained gluten! Sign up for Dr. Ritamarie's Gluten Free Diet Resources to find out about the Hidden Sources of Gluten, Articles and Recipes. However, many grains can be processed in plants that process wheat so make sure your grains are certified gluten free. Dr. Loscalgo recommends a $99 test from EnteroLab to test for gluten sensitivity. Of course you can save the money and just try going gluten free for 1 to 6 months and see if your condition improves! You Don't have to give up Wheatgrass but Put Away the Nama Shoyu! Many of us enjoy a good shot of wheatgrass now and then and the good news is that we don't have to deny ourselves this healthful drink. But, make sure the grass is cut above the seed because the seed contains gluten. Nama Shoyu, commonly used in raw cuisine, is not gluten free but there are a number of gluten-free soy sauces on the market. Bragg liquid aminos is also a good gluten free substitute for soy sauce. A big thanks to Dr. Ritamarie Loscalzo! I'm going to try going completely gluten free for a month so that I'm inspired to develop more gluten free recipes and to see how the change effects on my health. It should be easier to do in the summer when my diet is already filled with gluten free raw fruits and veggies. I'll let you know how it turns out. Stay tuned! These are the most delicious and healthiest BBQ chips you'll ever eat! I Finally get to Meet Abeba! Until today I had never met Abeba, the famous Krazy Kracker Lady, even though she had been a big influence on my cooking for almost a decade. 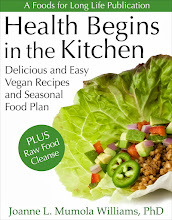 I had heard about her the very first time I attended a raw food potluck. We all met in a park in San Jose and someone brought out a basket of thin, delectable chips that had the flavor of pepperoni pizza. Being new to raw food, I was shocked to find out that these chips were raw! I immediately bought 2 of her books (she now has 4) and learned how to perfect raw chips and crackers. To this day, her techniques inspire and influence many of my recipes! So this weekend, while attending the Raw Health Expo in Sebastopol, Ca, I was THRILLED to find Abeba on the schedule of events. I attended both of her classes: one to make her "new and improved BBQ chips and onion rings" and the second on "quick and easy dehydrated breads". I was thrilled to finally meet Abeba and watch her demo! I've been to lots of cooking demos but who would have thought you could have this much fun? Abeba's joy is infectious! She's funny, entertaining and you can tell she's enjoying what she does immensely. The audience laughed hysterically as Abeba dramatically mixed her onion rings with a gooey BBQ mixture with her bare hands to the tune of "2001 A Space Odyssey" blasting in the background. With the boom box blasting out "2001 A Space Odyssey", Abeba dramatically mixes her onion rings. The secret to making light, thin and crisp chips is how she drops the mixture off a spoon onto the dehydrator sheet. It's also getting the consistency just right. I will tell you from experience, if the mixture is too thick, it won't drop off the spoon. If it's too thin, the mixture will lie on the dehydrator sheet like a puddle of water and the chips will fall apart. So Abeba spent a lot of time showing us the proper consistency of the mixture. Without further ado, let me share her BBQ chip recipe. You can find this recipe in her latest book, "Abeba's More Lip Smackin Favorites". Her famous Pizza Kracker recipe can be found in "Absolutely Abeba's Krazy Krackers". 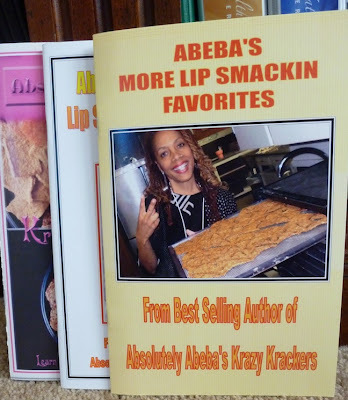 You can buy these and her other two books, "Absolutely Abeba's Edible Treats" and " Absolutely Abeba's Lip Smackin Favorites" on her website. ** Use white, Walla Walla or Vidalia onions but not yellow or red onions. *** Not certified gluten free but Frontier "follows strict Good Manufacturing Practices to minimize the potential for cross contamination but does not test for the presence of allergens to the final product". Put all ingredients in blender except flax seeds and onion, blend well and adjust seasoning to taste. Blender should be about 1/2 to 3/4 full. Add 1 cup flax seeds to the blender and blend well. Mixture should be slimy like a pancake batter but not to thick, just a little soupy. If a little thick, add a little of the sundried tomato soak water. If making BBQ chips, drop by spoonfuls on Teflex sheet, dehydrate at 105 degrees F. for 10 - 12 hours. Flip chips and dry another 6 - 8 hours or until desired crispness is obtained. For making onion rings, put sliced onions in bowl and pour most of mixture over onion rings. Coat the onions well by mixing with your hands. This amount should fill 3 1/2 to 4 trays. Put on Teflex sheets and spread them where they lay on top of each other but spread over the entire sheet of Teflex. Dehydrate at 105 degrees for 10 - 12 hours, flip onion rings and dry another 6 - 8 hours or until desired crispness is obtained. 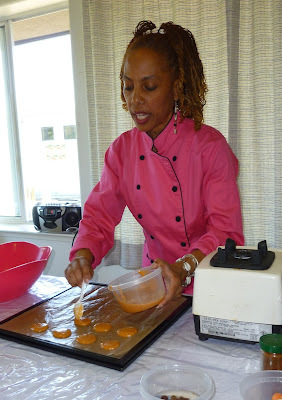 Abeba's note: There will be some batter left in bowl and you can slice more onions to finish the batter or make more BBQ chips or bell pepper chips, or just be creative and come up with a new krazy kracker! (In the demo, Abeba also used some of this excess mixture to pour over the onion rings once they were on the Teflex sheet). The next day she showed us how to make two types of raw bread. "Go Green Bread" made in a blender and "Carrot Bread" made in a food processor. These recipes can also be found in "Abeba's More Lip Smackin Favorites". Enjoy this spicy three bean salad without all the sugar! What is there not to like about beans? OK, there's that. But nutritionally, they rock. They are a great source of protein (without the saturated fat and cholesterol) and very high in fiber. Plus, they are inexpensive! Because of their fiber, they make you feel full so they can really help control your appetite. Their fiber also helps lower cholesterol and stabilizes your blood sugar. All around, they are great for your diet. And about that gas issue, draining and rinsing the canned beans will help. It's fun to have a vegetable garden. You get to plant unusual veggies that you don't normally find in the grocery store. This year I planted Dragon Tongue bush beans. They grew quickly and they are really beautiful. I'm using them in today's recipe but of course, you can use any fresh green bean. I love three bean salad. It's so colorful and I enjoy the contrast of the sugar and vinegar. But who needs all that sugar? So I thought I'd try making it with stevia. To provide even more contrast, I threw in a fresh jalapeno to spice it up! I get feedback occasionally from some of you who don't like stevia. For me, it's the only calorie and fructose free sweetener that I feel is safe. If you use it sparingly, it doesn't give you the bitter after taste that some complain about. For example, A typical three bean salad recipe calls for 1/3 cup of sugar or more. It only took 1/2 teaspoon of Sweetleaf stevia extract (which is equivalent to only 4 teaspoons of sugar) to give me the sweetness I liked in this recipe. If I had dumped in the equivalent of 1/3 cup of sugar before tasting it, I would have been very disappointed. So go very lightly with stevia and you will find that it's a very good sugar substitute. Dragon tongue beans before and after steaming. Unfortunately, they lose their unusual markings but thankfully, not their wonderful flavor! Not all Jalapenos are Created Equal! If you decide to spice up this recipe with a jalapeno, please remember that not all jalapenos have the same amount of heat. Yesterday, I made this recipe with a huge pepper and I removed the seeds. It wasn't very spicy at all. Other times, I have just added a few slices and it burned my mouth off! So be careful and try to gauge the heat of your jalapeno. Generally the smaller the pepper, the hotter it can be. And adding the seeds, of course, adds significantly to the heat too. 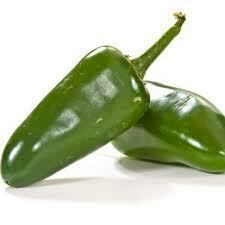 The "heat" of jalapenos can vary widely! In a large bowl, whisk together apple cider vinegar, olive oil, stevia, salt and pepper. Stir in the red onion. Set aside for 15 minutes to partially marinate the onion. Steam the green beans until fork tender - don't overcook. Drain and rinse in cold water. Add jalapeno, green beans, kidney beans and garbanzo beans to the bowl and gently mix with the vinegar dressing. Refrigerate for several hours, stirring occasionally, to allow the flavors to blend together. You can even make it the night before. Per serving (6): 224.6 calories, 10.6 g fat, 1.3 g saturated fat, 0 mg cholesterol, 7.2 g protein, 28.5 g carbohydrates and 8.0 g dietary fiber. Per serving (8): 168.4 calories, 7.9 g fat, 1.0 g saturated fat, 0 mg cholesterol, 5.4 g protein, 21.3 g carbohydrates and 6.0 g dietary fiber. These nutrient calculations include all of the dressing. As you know, some of it stays on the bottom of the bowl, especially if you serve it with a slotted spoon. So you are probably consuming less calories than stated here. The Mother Of All Smoothies! Healthy And Delicious, High In Fiber And Omega 3. Also, How To Freeze Seasonal Fruit! Fruits, veggies plus healthy additions make this the Mother of All Smoothies. Contains almost half the daily requirement of dietary fiber and over 3 grams of ALA omega 3 fatty acid! My morning smoothies are like a chemistry experiment. Every day, for the last week, I've been drinking and perfecting this recipe. 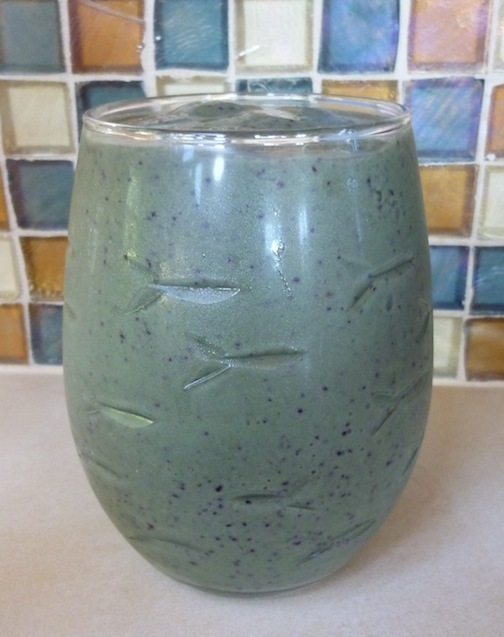 It has a number of the healthful ingredients I've used in previously posted smoothie recipes. I always start with some dark green veggies like kale, spinach or chard. Lately I've been adding other vegetables like cucumbers or celery. To make the smoothes sweet and delicious, I add a small banana and some big juicy figs that I still have in the freezer from my neighbor's last years crop. ( I also drop in a packet of stevia for added sweetness). To get lots of vitamin C and some "detoxing" pectin, I throw in an orange from my tree, skin and all! Sometimes, instead, I use an apple or pear, depending on availability. And, of course, I always keep a huge bag of frozen blueberries in the freezer so I add a cup of them for their high antioxidant properties. Sometimes I throw in the tops of strawberries that I keep in the freezer too. * Brazil nuts for their enormous selenium content. Selenium is a mineral with high antioxidant properties. * Unfiltered Flaxseed oil for its ALA omega 3 fatty acid content. * Vitamineral Green - my absolute favorite green "superfood" by Healthforce Nutritionals. * Matcha powdered green tea, known for its many health benefits. 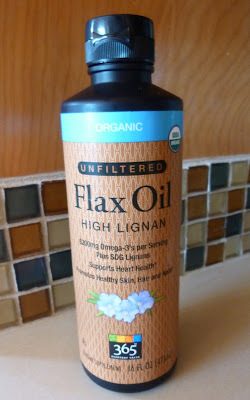 This brand of UNFILTERED FLAX OIL provides 6.2 g ALA omega 3, plus 10 - 14 mg SDG lignans. Lignans contain phytoestrogen substances which are associated with lowered breast cancer risk, heart health, improved immune function and many other health benefits. I noticed this product is manufactured in the same plant as wheat products so I don't think it is guaranteed gluten free. VITAMINERAL GREEN contains a large collection of green foods like wheat grass, broccoli and kale juice, nettle leaf and many others. From the waters are spirulina and chlorella. From the oceans are sea vegetables like kelp, dulse, laver, bladderwrack and more. Each heaping tablespoon contains necessary digestive enzymes and probiotics. If you experience beneficial cleansing reactions, start out with a lesser amount. Latest formulation is vegan and gluten free. Green tea is my favorite beverage. I enjoy hot Sencha tea and I use a powdered "Matcha" in smoothies. 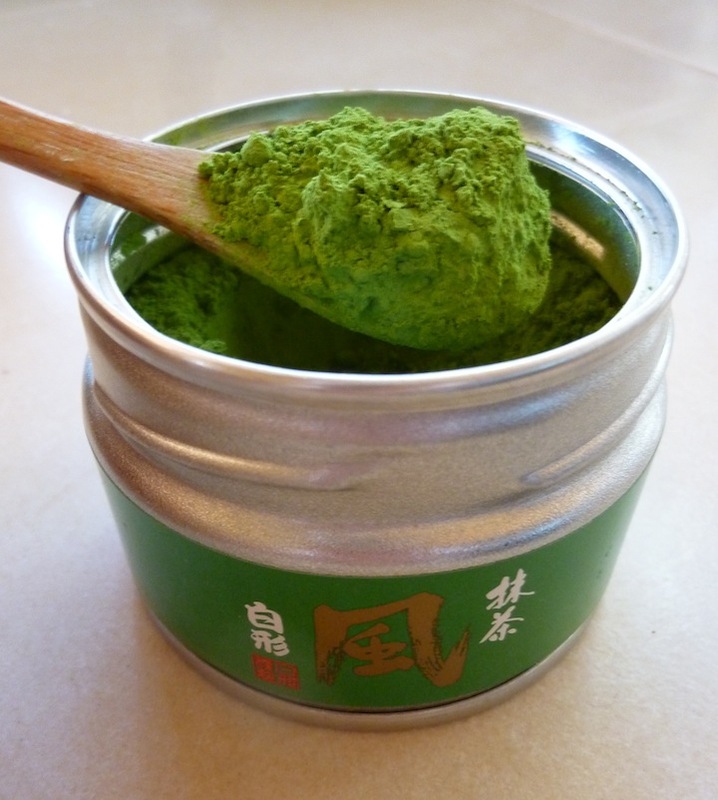 MATCHA POWDERED GREEN TEA contains the potent cancer fighting catechin antioxidant, EGCg. It has an ORAC rating of 1300 units/g (higher than blueberries and chocolate). 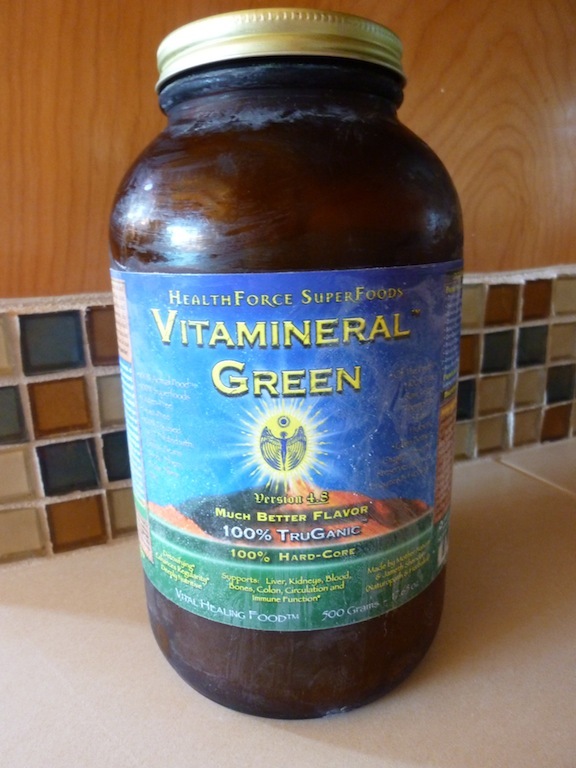 Its high chlorophyll content removes metals and chemical toxins from the body. It contains L-theanine, a mood enhancing amino acid. 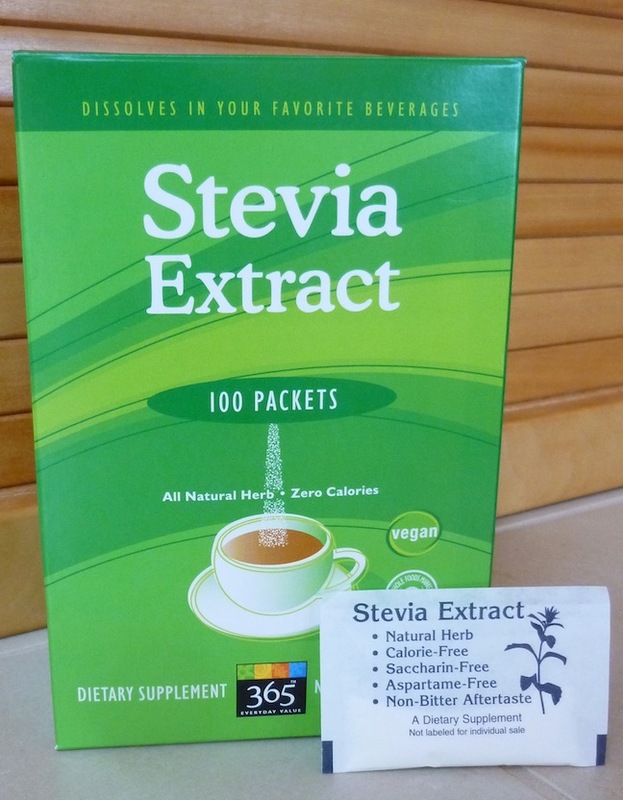 STEVIA is a plant native to South America. This natural sweetener has been used by the Indigo people for hundreds of years. It's been used as a sweetener in Japan and Brazil for 3 decades. It was only approved by the FDA as a food additive in 2008. It's a good, natural sweetener for diabetics and others wanting to avoid sugar. In the summer, you may end up with lots of beautiful fresh fruit. You may have fruit trees or a generous neighbor with fruit trees. Or, you may find wonderful deals at your local farmers market. In any event, you will have to figure out what to do with it all! You may want to use some to make Low sugar jam but if you want to enjoy raw smoothies throughout the year, your best bet is to freeze it. Just throwing fruit in a freezer bag doesn't work very well. In a matter of weeks you'll have freezer burn and the fruit may turn a different, unappealing color. To successfully freeze fruit you'll need a heavy plastic bag and a vacuum sealing machine. There are a number of products available. Since we bought ours a while back, I don't really know which is currently the best on the market. I can only say it was one of the best purchases we ever made. 1. Clean fruit and dry it. 2. Halve or quarter figs or slice peaches or apricots but make the slices big enough so that they can stand up on a cookie sheet. 3. Place fruit skin side down on a small cookie sheet that fits in your freezer. 4. Freeze the fruit until it is hard. 5. Place frozen fruit in the plastic bag that comes with the vacuum sealing machine keeping the fruit pieces in a single layer. 6. Seal the bag with the machine making sure the fruit remains in a single layer. A FoodSaver vacuum sealing machine that we bought years ago. You can buy individual freezer bags or a continuous roll that allows you to adjust the size. We froze these figs 9 months ago and they were still fresh and delicious in this morning's smoothie! Notice how we kept figs in a single layer. That makes it easier to break off the frozen pieces as needed. * For a completely raw smoothie, replace soymilk with 1 1/2 cups cold water, 12 soaked, raw almonds and 1/2 teaspoon vanilla extract. ** Cut down the amount to start with to avoid a possible cleansing reaction. Add all ingredients to a Vitamix or high speed blender. Per serving (with soy milk): 384 calories, 12.4 g fat, 2.3 g saturated fat, 3.2 g ALA omega 3 and 2.2 g omega 6 fatty acid, 0 mg cholesterol, 11.2 g protein, 59.5 g carbohydrates and 10.9 g dietary fiber. Per serving (with raw almonds, water and vanilla): 345 calories, 12.9 g fat, 1.8 g saturated fat, 3.2 g ALA omega 3 and 3.9 g omega 6 fatty acid, 0 mg cholesterol, 8.2 g protein, 54.3 g carbohydrates and 11.6 g dietary fiber. Make jam that tastes like fruit, not sugar! Whole Foods had a big sale on raspberries last Saturday. My friend Mitzie loves raspberries and I knew that I would be seeing her the next day so I bought her 1/2 a flat. She was excited! The following day, about 45 minutes into the drive to her house, I noticed a cherry stand which made me think of fruit which made me remember that I left all her raspberries back at the house! I was so upset that she would be disappointed but it would have taken an hour and a half to back track. I begged her forgiveness and hoped that she would find beautiful raspberries nearby. When I got home, I realized that I had nearly an entire flat of these beautiful berries - the ones we bought for her and the ones we bought for ourselves! After 3 days of eating as many as we possibly could eat, I decided to make a few jars of low sugar, raspberry jam! I've written a number of times about Pomona's Universal Pectin. This wonderful product has allowed me to make healthy jam over the years. Other pectins call for more sugar than fruit! * 4 one cup jars with 2 piece caps. Although the bands can be reused, always use new lids. * A boiling water canner - since I only was making 4 small jars, I just used a deep pot with a rack inside. The pot should be deep enough so that the jars are submerged at least 1 to 2 inches under boiling water. * A small masher to mash the fruit. * A saucepan to cook the jam. * A jar lifter (my favorite tool to move hot jars around without burning your hands). * A plastic funnel to help you fill the jars. * A small ladle to transfer the jam into the jars. 1. Make calcium water by putting 1/2 teaspoon of the white calcium powder into a small clear jar with a lid and adding 1/2 cup of water. Shake well before using and store in the refrigerator between uses. This makes much more calcium water than you will be using. It will last several months in the refrigerator. Discard if the white powder discolors or gets moldy. This recipe only calls for 2 teaspoons of calcium water. 2. Wash and rinse jars (run them through the dishwasher if you have one to get them sterilized). Pomona says you should let them stand in hot water but I generally take them out of the dishwasher and turn them upside down on a clean towel until I need them. Bring the lids and rings to a boil in a small saucepan: turn down the heat and let them stand in hot water. 3. Mash the raspberries until you get 4 cups of mashed fruit. Raspberries are fragile and mash very easily. 4. Place the mashed raspberries into a pan and add 2 teaspoons of calcium water. Stir well. Stir calcium water into the mashed raspberries. 5. Measure sugar into a separate bowl. Add 2 teaspoons of the tan pectin powder to the sugar and mix them thoroughly. Thoroughly mix the pectin into the sugar. Once boiling, add the pectin-sugar to the boiling raspberries. Stir vigorously for 1 - 2 minutes, until the pectin-sugar mixture dissolves. Return to a boil and remove from heat. It only took me a minute to dissolve the small amount of pectin-sugar mixture into the boiling raspberries. 7. Fill jars to 1/4" to the top. Wipe rims clean and screw on 2 piece lids. You can use a plastic funnel to help you ladle the hot jam into the jars or you can just carefully spoon it in. 8. Using a jar lifter, place filled jars into boiling water canner. Make sure they are covered with at least 1 to 2 inches of boiling water. Cover the pot and boil 10 minutes (add 1 minute more for every 1,000 feet above sea level). This isn't a boiling water canner. Since I was only making 4 one cup jars, I just used a deep pot with a circular rack on the bottom. 9. Carefully lift the hot jars from the boiling water bath with a jar lifter. Let jars cool on a rack. When they cool, they will make a big popping sound! That means they are sealed but check the seals to make sure. They should be sucked down. Carefully remove jars from boiling water. Cool on a rack. They will POP when they seal. I love that sound! 10. Now for the best part. Eat the jam on toast, muffins and bagels. It also makes a great topping for pancakes and waffles. For a treat, use it as a topping for ice cream! What's better than chocolate ice cream and raspberry jam? You can use this same recipe for Strawberry, Kiwi, Currant, Gooseberry, Sour Blackberry, Sour Cherry, Sour Plum and Pineapple! Other fruits may require the addition of lemon or lime juice and varying amounts of calcium water and pectin. You'll find these instructions inside each box of Pomona Universal Pectin. I've been featuring recipes that my children prepared during their visit. The first one was my daughter-in law's Garlic Vinaigrette Salad Dressing and the second was my son's slow cooked Red Bell Pepper Sauce which I love to serve on vegan apple sage sausages. Today I'm going to share my daughter Linda's Fire Roasted, Honey Balsamic Tomato Sauce. She made it for me last year when I visited her in Minneapolis. I came home and tried to duplicate it and didn't quite do it justice. So during her recent visit, I took much better notes so that I could share it with you. For those of you who avoid honey, you may try making it with agave but I think the honey is key in this recipe as it pairs up so well with balsamic vinegar. I always struggle when I list how many servings a dish makes. Where a pasta or veggie recipe might be just a side dish for a meat eater, a pasta or veggie dish is going to be the main attraction for a vegetarian. So the vegetarian serving needs to be bigger. I get really annoyed at recipes that say they serve 4 only to find that they barely serve 2. So when I list a serving, it's usually a real serving! When you look at the back of a box of pasta, it calls 2 ounces a serving. That would mean that 1 pound of pasta serves 8 people. If I ever served 8 family members only 1 pound of pasta, they would expect several more courses to follow! (Our family definitely does not fear the carb). So for this dish, I'm compromising and saying that 1 pound of pasta serves 6 even though I know the standard is 8 and in reality, 4 hungry people could polish off a pound of pasta without breaking a sweat! In any case, this is enough sauce to serve with a pound of pasta and the number of servings you get out of that is entirely up to you. Just enjoy! After cooking the onions and garlic, push them to the edge. Heat oil to medium low heat in a Dutch oven or sauce pan and sauté onions for about 3 to 5 minutes. Add garlic and cook another minute. Push onions and garlic to the edges making a whole in the center of the pan. Drop balsamic vinegar into the center of the pan and cook it down for about a minute. Don't let it get too dry. Add honey over the reduced balsamic vinegar. Let it cook down about a minute until it bubbles and reduces slightly. Add basil, oregano and black pepper and stir everything together. Add crushed tomatoes and salt to taste. Add a few tablespoons of water to the can and swirl around to get the rest of the sauce. Add to pan. Bring to a low boil. Reduce heat to a simmer, cover and cook for 45 minutes stirring every 15 minutes. If sauce seems too thin, remove the cover during the last 10 minutes of cooking. While the sauce is simmering, prepare pasta according to directions. Spoon sauce over pasta and top with chopped kalamata olives and fresh parsley. Per serving (sauce only): 94.8 calories, 2.3 g fat, 0.3 g saturated fat, 0 mg cholesterol, 0.3 g protein, 16.2 g carbohydrates and 0.5 g dietary fiber. Per serving (sauce, pasta and olives): 371 calories, 5.2 g fat, 0.3 g saturated fat, 0 mg cholesterol, 9.7 g protein, 71.4 g carbohydrates and 8.5 g dietary fiber. Raw Vegan Avospacho Soup - A Refreshing Dish For A Hot 4th Of July Weekend! Beat the heat with this raw Avospacho soup! I'm going to take a break from posting the recipes from our party so I can share a nice, cool, raw soup with you. After an unusually cold spring here in northern California, we are now having a very hot 4th of July weekend. I see that there are record breaking high temperatures all across the country too! I don't know about you but as soon as it warms up, I start making cold smoothies or fruit salads every day for breakfast and raw soups and salads during the day. Who wants to heat up the kitchen? So when it hit 97 degrees yesterday, I made this avospacho soup. I had a soup similar to this in a local restaurant once and I've been dying to recreate a raw version of it ever since. You can dice up almost any of your favorite raw veggies for the soup. I just happened to have some nice fresh corn, an English cucumber, a red bell pepper and of course, California avocados on hand. But you can also chop up a young zucchini, yellow summer squash, green onions, fresh tomatoes or tomatillos, radishes, celery, etc. Dice up your favorite raw veggies for the this avospacho soup! Add the "blended soup ingredients" to a VitaMix or other high speed blender and process until smooth. Evenly divide the chopped ingredients among 4 soup bowls. Pour 1/4th of the blended ingredients into each bowl and stir. Top with additional freshly ground black pepper if desired and serve. Per serving: 213.4 calories, 13.6 g fat, 1.9 g saturated fat, 0 mg cholesterol, 5.2 g protein, 22.4 g carbohydrates and 9.3 g dietary fiber.